This eleventh installment of the Discover a Guitarist series is a guest post from Danny Bellow of Pro Music Tutor. Andy McKee is one of the world’s leading guitar players. In fact, I’m going to go ahead and say it: if he did not play in a niche genre such as folk, as he does, and his stuff was more mainstream, he would probably be one of the highest rated guitarists by music fans all around the world. His distinct fingerstyle way of playing the guitar is also unique, with many experienced guitarists unfamiliar with what he does. Despite not being known to many mainstream music fans, McKee has still sold millions of records and posts viewing numbers on YouTube that many bands and musicians can only dream of. I first stumbled across McKee in the early months of 2007. Although he has been releasing music since 2001, it was in late 2006 that he first came to prominence, when one of his tracks, “Drifting,” was featured on both YouTube and MySpace. As soon as I realized the bandwagon was in town, I was quick to jump on and look at what was on offer. It did not take long for me to work out this was a train I did not want to get off anytime soon. If you have been shredding your guitar for years, have spent time learning a variety of styles, but still want to get something unique and fresh into your repertoire, then McKee is a guitarist you ought to study right away. It would be impossible for me to find the right words to describe McKee and his style fully, so just look at this video of “Drifting,” and you should see where I am coming from when I talk about how great a player he is. When you have finished with that, you can of course check out his other YouTube videos, but these other resources are also well worth your time. Joyland, his latest album, was released in 2010, and this is a double CD and DVD set. Art of Motion is my personal favorite, both for the sounds on the album as well as the fact this album gained McKee a lot of the mainstream exposure he richly deserves. You can also check out McKee’s full biography on his Wikipedia entry. So, how has discovering Andy McKee affected me? The biggest difference it has made both to me and the band I play with is that we are now a lot more flexible and varied with what we play. While we still want to push our own sound, which is a heavier style, being able to incorporate fingerstyling means that we can do stuff live that not many other groups are able to. While I have not yet experimented with the McKee style in a studio, it is a huge part of what we do in live situations, and enables me to help friends and other musicians who are looking for a guitarist to bring something different into their own act. The ultimate satisfaction for me is when people ask how I learned to do that, and I can point them to Andy McKee, who was the one who inspired me to expand my guitar playing horizons and take on something new. Danny Bellow has just started learning how to play guitar. 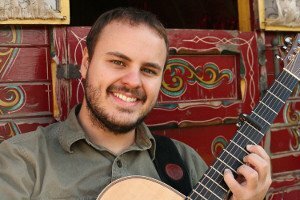 After discovering Andy McKee’s unique style of playing he was inspired to learn guitar online. Danny is already starting to master the basics of playing guitar and is excited about the potential the instrument may hold for him.